The Echinops which are also known as Globe Thistle are hardy herbaceous perennial plants with thistle like leaves and globular heads of pale blue globe shaped flowers. They belong to the daisy family - Compositae and grow wild in Southern Europe. Being of robust habit and tall growth, echinops can grow to 10 feet in height. 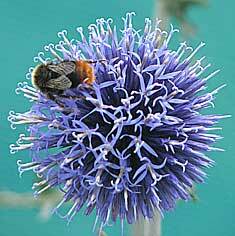 Echinops or Globe Thistles are suitable for the back of the herbaceous border and will attract many bees and butterflies into the garden. Echinops flourish in ordinary garden soil, but it must be deeply dug and well manured before planting. A sunny, well- drained position in the flower border is needed. Planting may be done at any time from October-March when the soil is in a workable condition and the weather is mild. Propagation of Echinops is done by division at planting-time. The crowns are divided into separate pieces, and these are planted direct into their permanent positions in the garden. Young plants may also be obtained by sowing seeds out-of-doors in summer, or root cuttings may be inserted at the same time in a box of sandy soil. E. ritro, which grows to 7 feet tall and is light blue in colour, is the favourite kind of echinops. It flowers in july. Other popular varieties of Echinops are E. Bannaticus which grows to 2 - 3 feet high,E. Gmelinii & E. Sphaerocephalus - 3 to 4 feet high. Advice about growing Echinops which are also known as Globe Thistle. Echinops are hardy herbaceous perennial plants with thistle like leaves and globular heads of pale blue globe shaped flowers.